the "florkens": We made the News.... in Ohio? We made the News.... in Ohio? Yesterday started off as a pretty uneventful day. I woke up... late. I went to work... maybe a tad late. I checked email and began working on a few projects due Thursday. Then, I took a small break to cruise through the regular apps on my phone. Facebook. Twitter. Instagram. 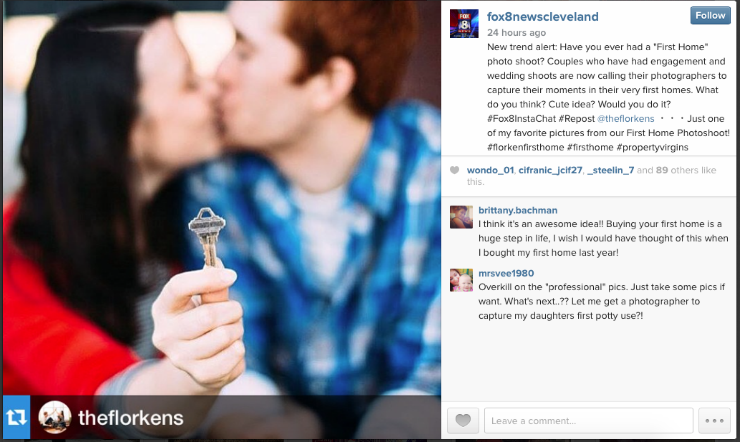 As soon as I logged into my Instagram, I learned that a news station in Cleveland, Ohio was sharing photos from our New Home Photoshoot (Part I and Part II) and asking their viewers whether the craze of photoshoots for first time buyers was a neat idea, or whether it was overkill. My first reaction was... well, mixed. For nearly a year now, the images from our photoshoot remain my Top Pinned images on Pinterest. Each day I see new people pinning them and I'm always flattered. I assume that the people pinning them are folks who have been inspired by them (much like I was by other First Home Photoshoot pictures) and want to make their own one day. The idea that these images are "out there" wasn't really surprising to me. What was surprising, I suppose, was that a news organization would simply pluck them up (yes, they linked back to our Instagram handle) and start a dialogue on whether they were cool or overkill. It was a strange sensation. I sent screenshots of the Instagram posts to Adam, who immediately responded, "Do we get paid for that?" and "Is that even legal?" I assured him the answers were most likely "No" and "Yes" respectively. Still, for hours, as I put my phone aside and tried to get back to work, there was a bug in the back on my brain that kept making me return to those images and how I felt about them. I love blogging. I do. That might be hard to believe considering that I've recently taken a very long hiatus from it. At the end of the day though, I love being able to make connections with people I don't know and learn from others. I've loved sharing #FlorkenFirstHome on this blog and I was deeply appreciative of all the reader support when I shared heartbreaking things. In a weird way though, I don't think I ever truly expected our posts to reach beyond those few people who show up at this blog everyday. 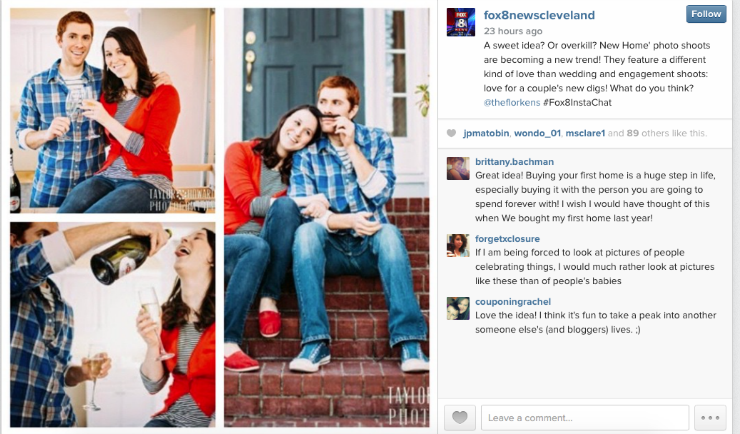 So, it struck me as super weird that a news station in Ohio not only ran across our pictures, but created their own collage of them and then shared them with 12.5K followers! Eek! So while a small part of me was flattered, a larger part of me felt violated. But when you think about it, how can I feel violated by something that I put out there into the world? Blogging is strange. This particular incident makes me think more about privacy and what I want to share online. In a way, I think that makes me smart and informed. But in another way, it makes me sad because as cheesy as it sounds, I feel like this space is small and only shared with those I love most. Of course, that isn't true as it's a public blog and I haven't even met most of our readers. In short, I don't know where exactly to draw the line. I don't know how to perfectly share while still maintaining certain privacies. I don't have all the answers. I wish I did, but I don't. I suppose I'm still learning. After over a year and a half of blogging, I'm still learning. When I blog, I try my best not to get too personal with stuff. Yea, pictures of parties or outings are okay, but if I was going to a funeral or seeing a sick family in a hospital will not go up on my blog. I will talk about it, but I won't just take pictures just to have something to show. Blogging is really weird. It would creep me out too. It kinda creeps me out when friends that I didn't know read my blog tell me about what they read, and I think the same thing. I put it out there, why am I surprised that people read it? Why do I feel creeped out by that. It's a blogging catch 22! Ew. It's one thing for people to interact with your content and give you feedback on your blog or other social media platform that you control, it's a whole other thing for a company to take your pictures and use them on their social media platform for their own purposes. As a fellow blogger, what they did makes me feel a bit squirmy. Like the internet, blogging is always changing and I've yet to wrap my mind around it. At times I feel like I need to scale back but then I know barely anyone is reading, so who cares? But this would kind of equally excite me/freak me out. At least it's a positive story and awesome photos of you! I think as long as you are doing what feels right for you it's okay...I just worry about what I"ll think 20 years from now! This is really odd! They should have, at the very least, contacted you first. I would have such mixed feeling about it too! I mean, it's great publicity for your blog, and fun to see yourself in the news. BUT - I feel like at the very least it would have been courteous of them to ASK you about it, maybe even interview you, before using pictures of you and asking the world their opinion about it! I'm with Adam, is it really legal? I mean, you have the little copyright thing at the bottom of your page! You're the lawyer, so I'll trust that you're right when you say it is legal, but it's crazy that the news can just take pictures off your website and use them for whatever they want. For the record, I think it's a cute idea. 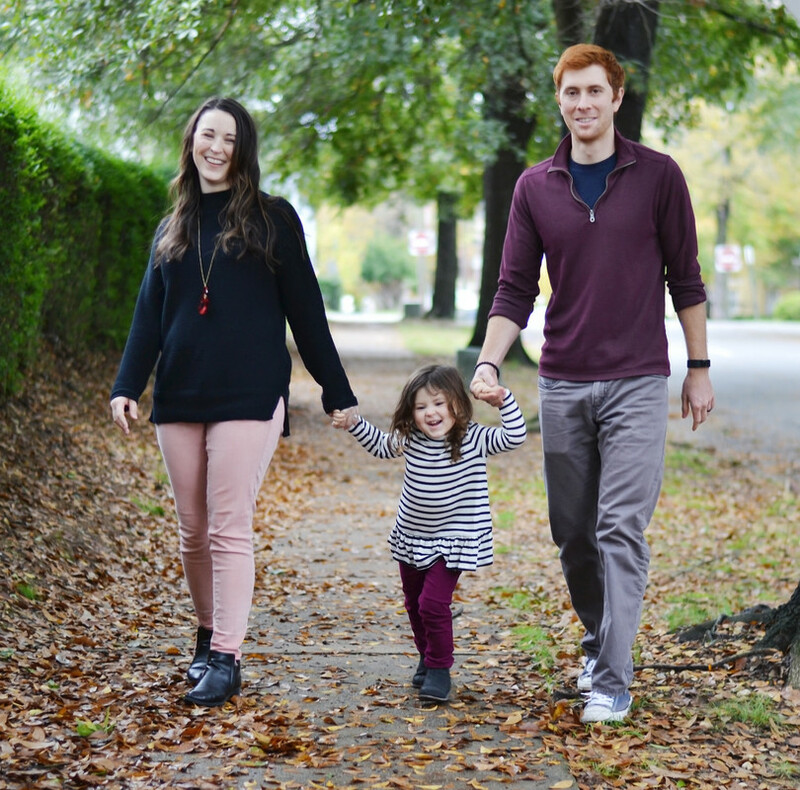 No one would be questioning a family photo session for any occasion if you had kids, so why should it matter that a couple without kids wants to celebrate a big moment in their life with some pictures? And who cares what other people think anyway!? If it makes you happy, that's all that really matters. This is an interesting thought! I can totally see how you'd feel both things. I think I would feel violated because they were taking my stuff and asking people's opinions on something that I really love or enjoyed and seeing the negative side of it would be hard. I think your new home pictures were awesome!!! :) We never did any.... mostly because our house was a disaster. But I still think about doing a photoshoot in our house after we're finished this summer because it's our home, it's where we live, and it's very us. I think your feelings are 100% normal. A "heads up we're using your photos" would have been the appropriate thing to do. It is very, VERY weird! It would be one thing if it was some other random blogger or Instagram user (but of course, still creepy and weird), but the fact that it was a news station would be kind of infuriating to me. You'd think they would be professional about it and not just creepily steal your pictures and then ask everyone to judge you. I think that's my biggest problem--it's one thing to just take pictures, but then they set it up in a way for people to say mean things about you and judge you. And for the record, it's really nobody else's business what kind of professional photos you get. Yes, you put them out on the internet, on your blog, but people don't have to look at them, they can always navigate away. I would think they should at least contact you first?? I don't know, but this confirms my decision to not share pics of my daughters on my blog or instagram! That's awful! You'd think, if they were linking back to you anyway, they'd take the time to send a quick message asking if it was ok. Just making the photos public shouldn't make them public property - just think of all the times bloggers get into trouble for using photos without attribution. That's odd...though I really wish I would have watched the news yesterday and seen it because I would have freaked out!! haha! It's just weird to me that they didn't like reach out to you and say "hey- we're doing this." I'm not really shocked by this b/c new needs rating, and you never know who is looking at your blog. In school (PR/Bis Major) I learned that don't post anything that you wouldn't want up on the newspaper front page. That's always been my mindset. I still think that they should have included you in their story though. I'm really surprised that an actual news organization didn't contact you to get your permission to use them - I feel like that's a further sign about Instagram and other newer social media networks really blurring the rules on copyright and allowance. If I was you I'd be a little bothered and creeped out too. Especially because it was almost as a mockery of a sweet moment you often cared about. I'm new to blogging, but this has quickly become something I think about frequently. That is really an interesting topic. It is so hard to keep things private but when big new stations from another state are sharing your pictures without your consent (Or the photographers for that matter) that's a bit much. Wow. That's all I have. I hope you get to the point where you feel okay with that. If not I hope you at least give them a piece of your mind. That is SUPER weird. I have a tendency to overshare in my pursuit of honesty and authenticity so I try to have my husband help in reeling me back in when I get too personal. It is freaky, though, that anyone can access your pictures. That is so weird they didn't even give you a heads up. I mean, at least you got credit via tag, but still, warning woulda been nice, eh? Im not sure how I'd feel either. I like that they credited you but they should have informed you before the fact. I have always loved those photos though so its flattering as well. I dunno. Both a win and a fail on their part. I think i'd be flattered and freaked. I mean find someone on Ohio! I would totally be on the fence with this too. I definitely think they should of given you the courtesy of a head's up first and not just let you stumble across it because they tagged you after the fact. I feel like the new station should have contacted you to let you know they were using those photos, because I don't think technically they have permission? plus who's to decide what you should take photo shoots for? I think the first house thing is a great idea, that's a BIG life move. also. also. your pictures are adorable. That is crazy ... just crazy. I think they should have needed to ask for permission but you are the lawyer (and I love the idea, by the way)!